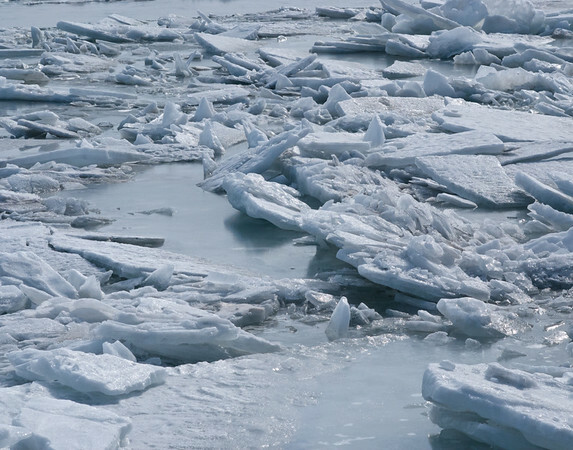 Each winter huge floes of ice move down the Detroit River from Lake St. Clair into Lake Erie. As the ice moves down the river and collides with an ice jam, it is crushed and thrust upward or thrown down into the depths by the massive pressure of the water that pushes it along. The water never stops flowing, the ice never stops moving. And the constant sound of the ice cracking and grinding as it is forced into the jam is mesmerizing—frightening and beautiful at the same time. Thin winter sunlight creates jagged shadows on the surface and filters through the thick slabs of ice, fading into the cold blue depths of the water. It is difficult for humans to understand the magnitude of this natural force. The weight of the water in the upper Great Lakes pushes frigid northern winter ice into fantastic masses, warning us about the power of the natural world, and seducing us with its beauty.